It’s the year that New York caught up to Europe when it comes to radical interpretations of the classics. On stage in 2016, there was Phyllida Lloyd’s all-female “The Taming of the Shrew,” set at a Trump-produced beauty pageant; Ivo van Hove’s “The Crucible,” set in a classroom; and at the Met, Mariusz Trelinski’s “Tristan und Isolde,” set on a warship. No surprise, all those directors are European, and, for better or worse, their names tended to dominate reviews of the respective productions. Shakespeare, Miller, and Wagner are only writers, after all. Sam Gold, an American, joins this hip-directors foray with his updated and transplanted “Othello,” which opened Monday at Off Broadway’s New York Theatre Workshop. 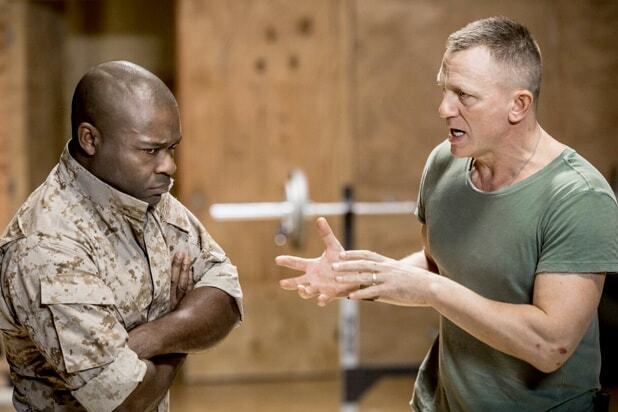 The starry casting features David Oyelowo in the title role and Daniel Craig as Iago. Their appearances are muted by the fact that both actors are introduced to us in the dark on the NYTW stage. More startling are the many dirty mattresses strewn across the stage floor before the play begins and the lights go down. It’s home to the battle-scarred soldiers (both male and female, in desert camouflage) who climb into those beds with their rifles, night-vision goggles, and iPhones close at hand. Scenic designer Andrew Lieberman has turned the entire theater into a plywood box. It looks very likely to ignite with the drop of one lit match, and figuratively it does explode. Iago’s motivation for wanting to destroy the Moor goes way beyond Cassio getting the promotion he covets. Craig plays the character like a dry drunk suffering from withdrawal in the booze-raddled camp of worn-out fighters. Because they’re soldiers, none of them needs an excuse to do what they’ve all been trained for. Best friends one moment, they’re at each other’s throat the next. Craig fully exploits the dual play of camaraderie and competition, and it helps that his unwitting accomplice Roderigo is a dunce, with Matthew Maher effectively mangling the Bard’s poetry for nifty comic effect. Convenient, too, is the easily led Cassio of Finn Wittrock, who’s generically handsome and boisterous in a Tom Cruise kind of way. Best of all, Craig’s Iago cons the audience as well, his many soliloquies paving a path to put us on the side of the devil. The multiracial cast blunts the usual black-white divide of Shakespeare’s tragedy. Here, Oyelowo stands apart by bringing a regal bearing to the role: He’s a general hanging out with a bunch of grunts; at other moments, he’s suffering from a major superiority complex. Gold has injected him and his soldiers with so much testosterone that the stolen handkerchief (a long scarf in this production) emerges as just one other reason to beat somebody’s head in. Thomas Schall’s direction of the fight scenes (and many murders) leave the audience gasping. It’s all very movie realistic, as are Oyelowo’s many epileptic fits, and he effectively performs the play’s second half as one long mad scene. Oddly enough, Gold’s “Othello” might be better enjoyed if you missed the first couple of scenes. As insightful as the staging often is, the female characters don’t always make sense in this man’s world. Iago’s wife, Emilia (Marsha Stephanie Blake), and Cassio’s girlfriend, Bianca (Nikki Massoud playing her as a Muslim), are double-cast as soldiers in the beginning. Far more confusing is Desdemona (Rachel Brosnahan). She’s obviously not a soldier, but neither is she Marlene Dietrich in “Morocco” following Gary Cooper’s French Foreign Legionnaire through the desert. What’s clear is that she’s not a virgin, despite what her father, Brabantio (Glenn Fitzgerald), says and believes. But considering the rather squalid army accommodations, not to mention how everyone’s sleeping around on all those mattresses, the fact that Othello and Desdemona even bothered to get married comes off as quaint, if not the height of decorum considering the circumstances. Not helping the situation is Brosnahan’s school-girl approach to playing the Moor’s bride.